Modeled after lighting found in all the lounges, we used two 4 foot flourescent light units with plastic bulb covers. We hung the lights as shown in the diagram end to end across the wall. Heavy duty cardboard was used to direct the light up and down the wall but not straight out into the room, resulting in a lit room without being blinded by the light. The cardboard has tin foil on the side facing the wall and black gaffers tape on the outside for appearance. The cardboard does not even get warm after being on for hours so does not seem to be a fire hazard. We ran the cords down the wall and plugged them into a powerstrip, this allows there to be a common switch to turn on both lights. Following the same idea we bought 24" flourescent fixtures for our desks. 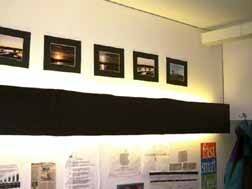 We mounted them on the underside of the bed and built cardboard covers to direct the light only onto the desks. These are connected to another powerstrip for another common lightswitch. As an added bonus if you turn off all the other lights in the room but leave these on, the light is concentrated under the beds only in the desk area. This allows one of us to go to bed while the other works into the night.